If your little one is anything like my little Miss then having snacks on hand when you're on the go is a must! Little Miss is so obsessed with snacks that she would eat them in the car as we are leaving the house if I let her! If I forget to bring snacks with us on our adventures, I risk to cause a tantrum or risk buying unhealthy snacks - not sure which is worse! Little Miss recently started preschool which means I have to prepare her morning tea and lunch three days a week (insert stressful thoughts). I couldn't stand the thought of giving her the same snacks every day so the guys at Whole Kids came to the rescue! Whole Kids was founded by Melbourne parents Monica and James. They thought of Whole Kids ten years ago when they couldn’t find any healthy, tasty and convenient snacks for their family. They felt like just about everything was full of junk. They believe in healthy kids and a healthy world and un-junking their food and their lives. They only choose the finest quality organic ingredients they can find and don't put any artificial colours, preservatives, flavours or other nasties in their products. Sounds good to me! I started buying Whole Kids products from our local greengrocer when we lived in Melbourne when little Miss was one. Her go-to Whole Kids organic snacks are the apple & sultana and the apricot manuka honey fruit filled bars and the sea salt popcorn. Until recently, we didn't realise that the range of products is so much bigger than at our greengrocer back in Melbourne so it was only suiting for us to give the rest a go - hard work I know ha! Whether it's just a quick snack for a trip to the playground, part of a lunchbox for school, a fun treat, a healthy party 'lolly' bag or a healthy snack at home - Whole Kids snacks are multi-purpose! Like many parents, I like to understand what's in the food I feed my children and where it comes from. 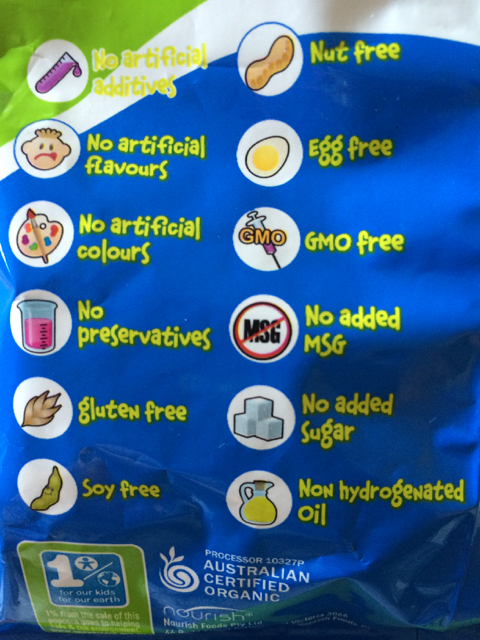 The best part about Whole Kids snacks - they are Australian certified organic and each packet has info which lets you know what's in them, their nutritional value and more importantly what's not in them like the photo below from a popcorn packet. We had a bit of fun trying Whole Kids products! Little Miss' favourite Whole Kids' snacks would have to be the corn chips, popcorn, crackers and fruit bars but we tried all the others and since they are now all gone and I had to buy some more for the photos I can safely say she loved them! We are holding off on the Whole Kids Frooshies for little Mister for a few months as he has just started solids so I will have to report back. 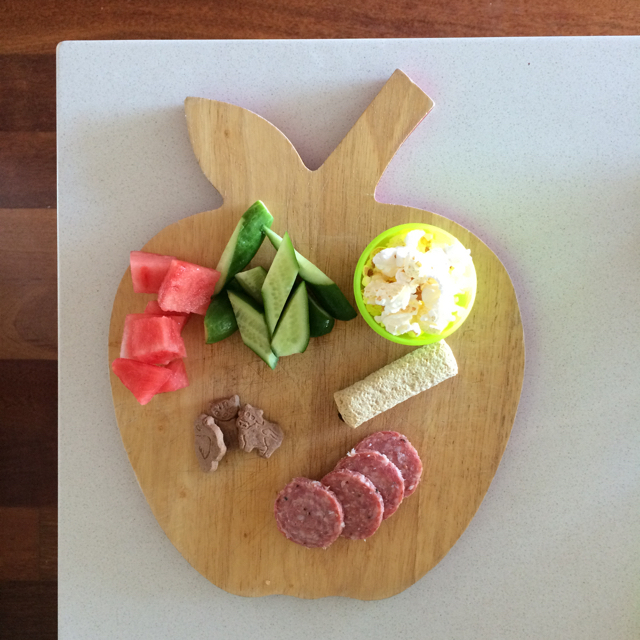 A quick 'out the door' snack for little Miss for the park. Whole Kids Organic Sea Salt Corn Chips and Whole Kids Little Munchkins Organic Apple & Whole Kids Sultana Fruit Bite. A fun game of 'Old MacDonald had a Farm' with Whole Kids Little Munchkins Organic Farm Cocoa Biscuits. The game ended pretty quickly after little Miss figured out we could eat the farm animals so poor Old MacDonald 'had' a farm is now accurate! 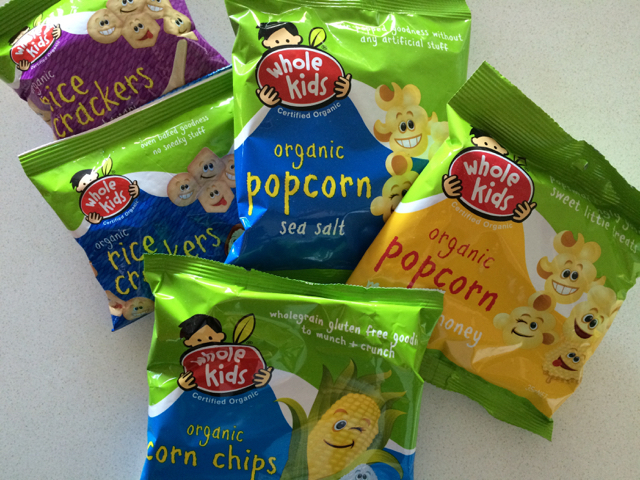 Whole Kids Popping Organic Popcorn, Whole Kids Organic Rice Crackers and Whole Kids Organic Corn Chips. Little Miss loves their crunch! Preschool lunch with Whole Kids Organic Sea Salt Popcorn, Whole Kids Little Munchkins Organic Farm Cocoa biscuits and Whole Kids Little Munchkins Organic Apricot Fruit Bite. Party 'Lolly Bags' without the lollies! I have used the Whole Kids fruit bars in little Miss' 'lolly bags' since her first birthday combined with a mandarin and other healthy treats. I get blank stares from the kids when I hand them out but the parents are all smiles knowing those 'lollies' won't cause meltdowns and I hear later on that the kids loved the treats anyway! I got funny looks from a mum when I gave little Miss her Whole Kids fruity water at a recent playgroup catchup. She thought it was juice but even if it was juice from Wholekids it would have still been better than most juices out there! Little Miss had the Whole Kids Organic Apple and Raspberry Fruity Water which is 70% organic apples, raspberries and 30% spring water. It has less than 7gms of sugar per 100ml which I am comfortable with given she only has juice or fruity water a few times a month and drinks water the rest of the time. We had so much fun reviewing Whole Kids products - thanks guys! For more info about Whole Kids, checkout their website.